As a kid, like many in my age group, I grew up watching the Star Wars films. I'm just barely old enough to remember sitting in the theater waiting for A New Hope (episode 4) to begin. I was 4 years old at the time. I'm not what you would call a die-hard fan. I had very few Star Wars toys as a child. Compared on their technical merits, the action figures were quite lacking when compared to GI Joe, for instance. However, the ships, the special effects, the droids. I loved it all. 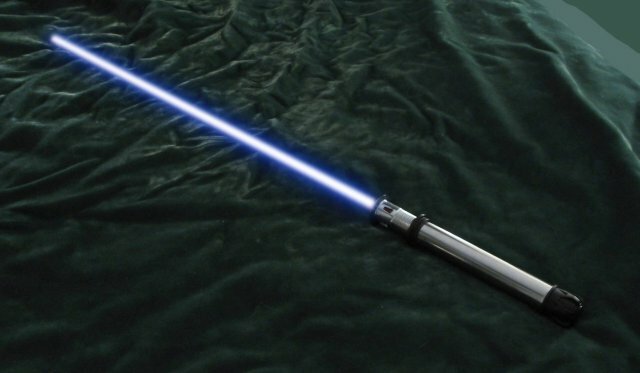 The lightsaber sticks out as one of the most interesting concepts in the movie franchise. As an amateur swordsman, having collected swords for many years, and attending renaissance faires and learning fencing and historical swordsmanship, I see the lightsaber and it's combat choreography as just one more form of swordplay that I can appreciate. 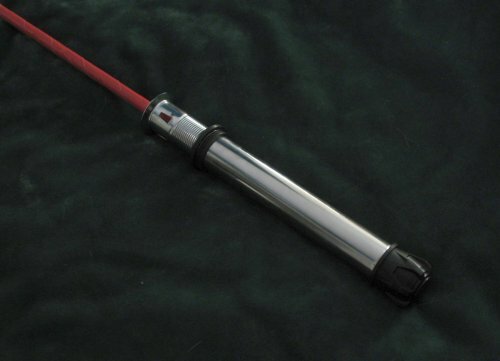 So it comes with little surprise that I've collected a few lightsaber replicas over the years, and that I'm starting to take an interest in building the props and performing some rotoscoping of the lightsaber glow effects. Since I'm relatively a late-comer on the scene, many out there have accomplished far more than I probably ever will. There are others out there who have gotten the rotoscoping and choreography down to a science, as well as saber-hilt construction with lathes and CNC machines. Take for example the Ryan vs Dorkman duel films (more info here and here). These fellows have created what is largely considered to be the best lightsaber duels ever made, including the actual Star Wars movies themselves. The work of such individuals is very noteworthy, and very entertaining to watch, but should not be held on such a high pedestal as to discourage others from trying. I believe there are many more stories that can be told, and much of the fun is in the doing, as well as the watching. That said, the accepted style of choreography doesn't necessarily have to be the one and only way either. In the RvD videos, despite how well done they are, there are still moments that make historical fencers cringe, due to bad tactical moves and maneuvers designed to waste a beat to keep the timing smooth. Choreographed combat will never completely resemble the real thing, for better and for worse. And the audience, I believe, grows more savvy with each passing year. Can I do better? No, I don't think so. But I might be able to be different if I manage to work on such a project. The hardest part of course is to find willing participants who will be just as committed to the final result as you are. I don't expect to be making any exciting battles any time soon. In early 2007, I decided that it was finally time to do some rotoscoping. Rotoscoping is, for all practical purposes, the term used for drawing animation over real footage. Originally this was done with a "rotoscope" machine. 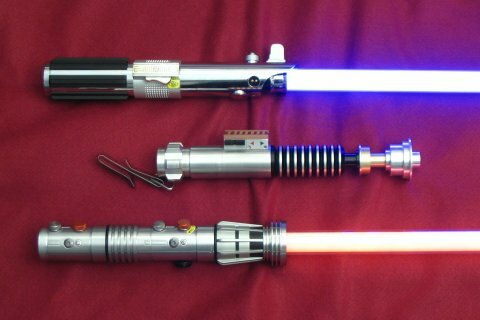 The technique has been used for lightsabers, disney character animation, and a wide range of other purposes. For lightsaber effects, the fan community has been doing digital rotoscoping on their computers for many years now. There were examples of people doing it back around the time of The Phantom Menace's release (ep. 1). It became much more widespread by the time Revenge of the Sith (ep. 3), due in part to increased fan interest, and also due to improvements in the available software options. So nearly a full two years after the last movie's release, with many fan projects already out on Youtube and other websites, I'm definitely a late-comer. I've wanted to try this since before the prequel trilogy but never wanted to invest the time and money in software. Armed with a copy of FXhome's EffectsLab Pro software and a camera, I finally had the tools I needed. So I just needed a prop to get started. My first rotoscope test was a "proof of concept" for myself, using video I had already recorded of myself doing test-cuts with a katana, and accidentally striking the target's support peg. This sample is viewable on the right side of the page. But I needed a good prop to use for anything more significant. The Force-FX lightsabers look great, but have enormously thick blades, and I'd feel less comfortable swinging them around in confined spaces, let alone use them for combat. By taking inspiration from a variety of websites, such as Big Yellow Box and Apocalyptic Production's tutorial, I built my first prop. Not an ideal one, mind you, but a start. It's pictured on the right as well. My first "lightsaber film" is only about 20 seconds long, and is a slight parody. Also viewable on the right, or here. 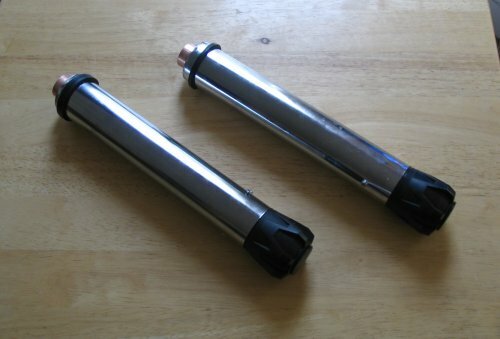 On the right I also have a picture of a set of twin saber hilts that I built. They look even less interesting or authentic than the first, but they're tougher, and were much easier to build. They're just enough to have a metallic cylindrical object in your hand for combat sequences. I may add details and beautify them later, but for now they're functional, and that's all that counts since they're meant to be combat sabers and not beauty props.